The canal is 100 years old in August this year. If you haven’t had the chance to transit the canal, you should definitely put it on your list. I am not an engineer or have anything close to a mechanical mind, but the whole construction of this thing is just amazing. I am currently reading the book, “The Path Between the Seas” by David McCullough. The idea originated in 1870 but it was not completed until 1914. The French began the project and the American’s finished it. Because of it one nation, France, was rocked to its foundations. 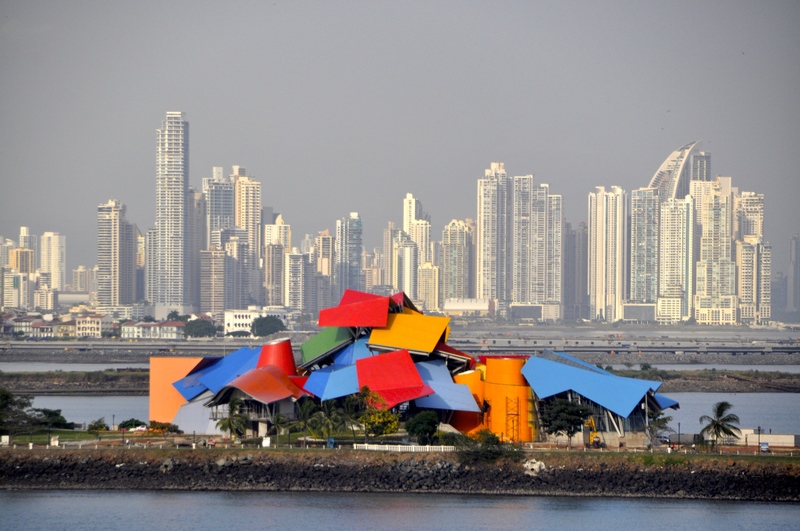 Another, Columbia, lost its most prized possession, the Isthmus of Panama. Nicaragua, on the verge of becoming a world of crossroads, was left to wait for a future chance. The Republic of Panama was born. The United States was embarked on a role of global involvement. I’m not providing a history lesson but I would recommend reading the book to anyone who is at all interested in learning about this behemoth construction effort. It literally changed the world of commerce. The three sets of locks the ships transit operate 365 days a year. The new construction of the additional “lane” of the canal was supposed to be operational in 2014 in time for the anniversary but the end is nowhere in sight right now. It will be enable the much larger commercial and cruise ships to make the transit where now they must go around South America, costing more and taking longer. 90% of the people who work on the canal are Panamanian since the US turned it back over to Panama. 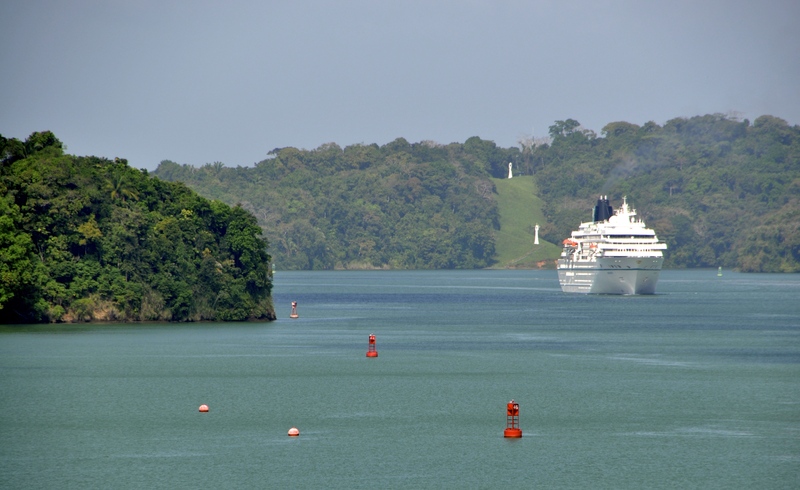 The man made lake, Gatun, is a world unto itself. Its beauty and size just leaves you standing by the rail in awe. I was able to kayak in the lake a number of years ago and the experience was unforgettable. 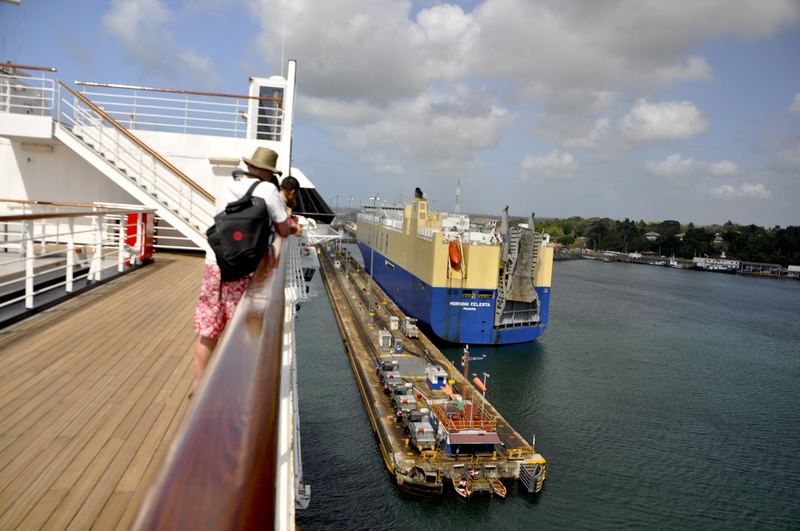 The larger cruise ships today pay more than $300,000 toll to make the transit. The lowest toll ever paid was in 1928 when Richard Halliburton, world traveler,swam through the canal. Based on his weight of 140 pounds, he paid a toll of $.36.